I am a man of no talent. I don't have big dreams in running and my lifetime running goal is simply a sub-3 marathon. All of the mileage, the workouts, the pain and thesoreness, the 5am early morning runs - everything that I do are all geared towards that single goal. And on that bloody Sunday, I ran 3.00.17 !!!!!!!!!!!! I took a chunky 3m30s off my PB. But for sure, this is one PB that I am not happy with ! Legs felt good during taper. Ran 9km easy on Monday, 11km with 4km MP and some hill strides on Tuesday, then 9km easy Wednesday. Flew out on a red eye flight on Wed midnight, arriving in Seoul on Thursday morning. Had a good nap at the hotel (JW Marriott) before heading out for 11km run with some pick-ups along the Han River bike path. Took Friday off but walked for about 5-6 hours. On Saturday, I jogged for 25mins and also walked around town for a couple of hours. Not sure if these walking around had any impact on that 17 seconds. Only God knows. Carbo-loading wise, I actually changed my approach a little bit. I ate normal quantity of carbs (rice, bread, buckwheat noodle), but I drank more carbs. To avoid digesting junks that come with food, I drank litres of gatorade, juices, and soft drinks. I believe this hits two birds in one stone, it hydrates you and at the same time it loads clean carbs without junks/fats. Weather was fantastic during the trip. A week before we arrived, temperature was around -5c min and about 0 max. When we were there, the weather turned nicely into a pleasant 5-10c. Left the hotel at 6am and took the subway to the start point. Had about 90mins to wander around, pee (twice), and do warm up. Weather was a pleasant 6c, which was perfect for me. When I ran the same marathon in 2010, it was 0c, which was too freezing to my liking, especially with the wind chill. The elites started at 8am (course record was eventually broken with a time of 2h05m) and us in the 'A' (<3.30 marathon) corral began 5mins later. My strategy is to ran a bit faster than goal MP in the first half, as the route is much easier. In the second half, there were 2-3 climbs, although ain't steep, but they are placed near the end when you feel the most tired. The first k was downhill and I had to hold myself back so that I splitted 'only' at 3.50 (that's my 10k pace, by the way). After that I began to ease into goal pace and crossed the 5k timing mat in 20.42 and the 10k in 41.38 (second 5k in 20.56). My average pace for the first 10k was 4.10 min/km. I felt like a transformer robot in the second 10k, clicking km by km at a very narrow range between 4.10-4.14 min/km. The first half of the course is easy and very much wind protected due to buildings and this allowed for consistent effort. On the flip side, the second half had several stretches which are open to elements, so my strategy is always to bank a bit of time. Passed the second 10k in 42.25 (21.16 and 21.09 for the 5k segments). Split at 20k was 84.03 or an average pace of 4.12 min/km. Halfway split was 88.41 (av 4.12 min/km). At this point, my Garmin was overstating the official distance by about 150 meters. Felt tired slightly, but in general, legs were still holding up. My 5km splits between 20-25km and 25-30k were 21.22 and 21.13, so a tad slower but still right at the goal pace. The third 10k was covered in 42.35. Cumulatively at 30k mark, my elapsed running time was 2.06.38, an average pace of 4.13 min/km. This still gave a projected finishing time of 2.58.07 assuming I could maintain the same pace. I cautiously felt confident that this could be 'the day', but as they said, marathon usually only starts at 20 miles. Garmin was now ahead of the official markers by around 200-250m. My pace began to slow due to tiredness. At the same time, there were a couple of spots where the wind affected my pace. We crossed a long bridge towards the south part of the city and this spot was open to elements. There were also a couple of places near the end where wind tunnels existed. I took my last caffeinated gel at km 31 and then an isogel (a pre-mix gel and water inside a satchet) at km 35 as mitigants to avoid the probable slow down. 5km splits between km 30-35 and 35-40 were 21.54 and 22.03 respectively, so I was fading big time. The fourth 10k was covered in 43.57 or an average of 4.24 min/km. However, due to the time in the bank from the first half, I crossed the 40k mark in 2.50.35. This gave a projected 2.59.57 finishing time assuming a constant pace. I told myself that I needed around < 9.25 to shower myself in glory. I smelled blood and began to close in for the kill and pick up the ante. Yes, I duly picked up the ante but unfortunately, the increased effort didn't translate to an increased pace. My tank was almost empty. My stride length got shorter. My cadence was lower. My muscles were burning like hell. I felt dizzy and disoriented and on a couple of occasions, I felt that I almost fainted. I was akin to being in a hypnotized, trance zone where everything around me moved in slow motion. But suddenly, I was awaken when I saw a herd of runners began to sprint like being chased by lions. I recovered from the groggy-ness and saw a 2.58 on my watch and started to make one last push as we approached the 1989 Olympic Stadium. I began to look at my watch anxiously every few seconds and saw a 2.59 when I entered the stadium tunnel. Is this it? Could this be the day that I've been looking forward to? Although, I ran the same race 2 years ago, but I couldn't exactly recall how far we had to run inside the stadium. 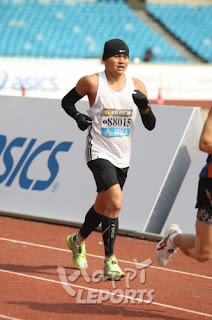 When I saw the 2.59.15 on my watch and I seriously thought that marked the official 42 km mark (my garmin was already showing 42.2 km), meaning we only had to run the last 200m on the track. Woohoo! 200m in about 45 secs? Yesss, baby !!! I left the stadium tunnel which was almost pitch dark and began to plant my jelly footsteps on the rubber athletic track. Now I was bathed in a daylight and I could clearly see everything inside the stadium. To my horror, the finish line was not 200m from the tunnel as I envisaged. It was located 3/4 lap from the stadium entrance tunnel. My heart sunked and I said "I am fooked". Whoever the Greek or spartan guy who first ran the marathon distance should have stopped at 42.095 km. To me, that 100m is worth 17secs…. During a ride back to the hotel, my mind was full of IF, IF, IF. What would happen IF I started the first half a tad slower, will this help me to avoid that 17secs? What would happen IF I rested my legs more instead of walking around the town before the race? What would happen if I take a cup of sport drink at km 40, will this keep my glucose level high and wake me up from my trance mode 17secs earlier? What would happen IF I do 18-week training plan and not the 12-week plan? Perfect weather (except for the wind tunnels) and a good marathon prep. Will I ever get a chance like this again in the future? In terms of marathon prep, I feel that the Pfitz plan suits me well. Although, the plan is very minimalist in terms of workouts (only once a week of tempo/speed session), but for a runner like me, this seems to be outweight by the endurance benefits from doing 2 medium long runs plus 1 long run plus 10-12km 'filler' recovery runs. Plus I didn't get injured at all during this cycle ! I also modified the plan a bit by incorporating workouts from other sources, such as Jack Daniels' infamous threshold-long run-threshold workout, Hanson's 2*6miles at sub-MP effort two weeks out, and an Aussie style fartlek (alternating fast & float recovery) and the combination of all these at least kept me in the hunt until the 40km mark. So damn close to my lifetime running goal. Hmmm….maybe it's now time to move the 'post' to 2.55 ? Bad luck Sling runner. Having run 3:00:55 and 3:01:03, I feel for you big time!!! All I can say is that sub 3 is hard for us non-athletes. Chin up! Wow! I tried to look up the results Monday but failed. Bloody good effort, and at least you can say you're a 3-hour marathoner. Probably sub-3 when you consider an 'official marathon' has 42 metres added to it and you probably didn't run the shortest line. Looks like Pfitz is the perfect plan for you. Have another go at Melbourne, or even a fast US course like CIM. I'm sure you'll do it. Hi, where do you find the detailed timings of the race? Have they been published? Congratulations on the PB! Commiserations on the missed lifetime goal. Fantastic effort. Sounds like you did 95% of it right. I know the feeling though. Four years in a row I feel like the big fish (PB for me) has got away from me in Melbourne. Plus I came up 8 seconds short in Perth 2008. Only thing you can do is learn from what worked, and what didn't, keep the same the things that did work, and make the changes needed to go all the way next time. We might both be chasing the big one again in Melbourne later this year? Agree that targeting 2.55 next time is a good idea. Sounds like you were on a winner there with the pre-race drinks based carbs. Lucozade has a high concentration of carbs. Much higher percentage than Gatorade etc. I am going to try and copy your strategy there, as what you hypothesise about foods putting too much unneeded stuff into the system just before the race sounds true to me, and my biggest error last year was being too dehydrated from 30km onwards. Well done!!!!! Congratulations! Hope you take 6 minutes off that one next time. I feel for you Sling. Widi as I said Sunday- damn close. Great effort though and looks like Pfitz works well for you. Great to see you go through this injury free and sets you up nicely for your next one- will be a moment to cherish when you smash it. 17" are the fuel which will motivates your running for the next one !